I studied art in college as I couldn’t take sewing – it wasn’t offered. Sometimes our path isn’t doesn’t always look like its headed in the right direction, but it is. I think this is exactly where I was meant to be. There are so many lessons and methods learned in art that are totally applicable to sewing. Had sewing been offered, I wouldn’t have even dawned the door of an art class nor know anything about art. But I did and now I lean on it extensively – for inspiration, direction and guidance. There’s a book out that’s really wonderful and has espoused what I have been talking about in my newsletters a lot…..finding your mojo….where to look for your mojo….where did it go and why. 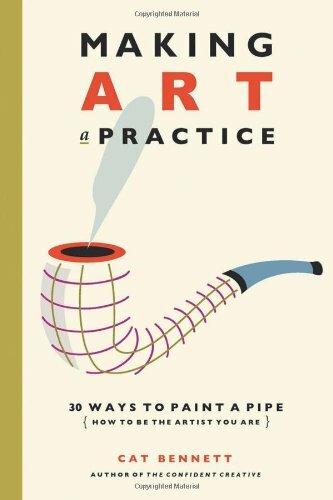 Making Art a Practice: 30 Ways to Paint a Pipe is the name of the new book. It refers to the Magritte painting, “Ceci n’est pas une pipe” (This is not a pipe). “Still, many of us feel trepidation when we set out on our creative paths. Despite gathering skills, we wonder if we can manifest our dreams. We see what other artists have done and are doing now. Can we really join them? Who are we as artists? What are we here to explore? Some of us begin our journey and get stuck en route. We loose or enthusiasm and our work loses its edge. We may well struggle to make a living at it. Art always poses challenges. It asks us to question and grow. Being an artist is a way of life and an art practice leads us forward. It gives us the tools of engagement and inquiry to be the best artists we are. OMG – how many times have you felt you lost your mojo and looking for it – you just had it and put it down someplace and can’t find it….and how do you find the dang thing again!!!! “This book speaks to the moment we cross the threshold of our dreams and step into the studio, whether that studio is a designated room or the kitchen table. It doesn’t matter if we’re beginning our creative journey or if we’re further down the path, our art practice gives us ways to begin and to stay engaged with giving form to our dreams.. It can help us to love our work and enjoy ourselves just as we are – no small feat. I’m sure you’re sitting there thinking – But Claire I’m not an artist. I never have been and never will be. Well, I’m here to tell you B-A-L-D-E-R-D-A-S-H!!!! That’s a bunch of malarkey. The exact same process that an artist goes through to create a work of art, whether it is on canvas, paper, on stage, in dance, music or whatever, is the exact same process that you go through when you are choosing a pattern to go with fabric, picking out how to make the pattern and working through all the challenges that the sewing project presents to you! Now you might have to change a few things. Like the business about – – A painting of a pipe is not a pipe; it’s a painting. More to the point, art leads us beyond ordinary perceptions to extraordinary ways of seeing and being. – – but the truth is that if you pare this down to basics, it does make sense for us…we often have a vision of what our project or outfit will look like and boy do we know the path to getting there isn’t always as straight as we would like!!! But here’s the thing, when the author is talking about Magritte’s comment on his painting, “art leads us beyond ordinary perceptions to extraordinary ways of seeing,” how many times have you looked at something differently because you have made the outfit or looked at a garment in a completely different way because you know how garments are properly assembled and know what is going on and more importantly what is not going on and what is not done. Lately I’ve been working through methods to get out of a stuck mojo. We all have them, and often they are for explainable reasons, which sometimes sounds like a lot of blah, blah, blah. But sometimes it’s worth listening to those reasons. And then to not only understand our creative process better, but not become so anxious about the process when it doesn’t seem to be flowing like a spring thaw waterfall! What I love about this book is that it seems to not only address the lost mojo, but also address how to work your way out of it. These methods are more concrete which is delightful considering that we’re dealing with a very VERY abstract condition….mojo loss – think about it. How would you translate mojo loss into a work of art or a garment?!!!! It would have a gazillion different iterations! The first chapter starts with: “If you can see your path laid out in front of you, step by step, you know it’s not your path. Your own path, you make, with every step you take. That’s why it’s your path.” ~ Joseph Campbell Wow! What a way to start a book!!!! I’m in the process of working through this book, and updates will be coming!! !